Is Your Mind Controlling You Or Are You Controlling It? What does it mean to believe something? Why are some truths hard to believe and some lies easy to believe? Is your mind controlling you or are you controlling it? Who really decides what you believe? In this video Harry discusses these questions and more as he examines the four types of belief systems and the intentions behind each of them. 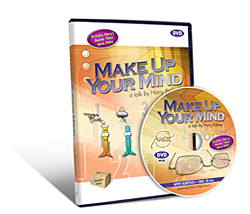 Go beyond linear evolution and take a sideways step into exploring and understanding the relationship between your beliefs and your experiences with Make Up Your Mind. Recorded live at The International Avatar Course on June 30, 2007 in Orlando, Florida. "My mother, bless her heart, could sometimes be an impatient woman. Was your mother ever impatient with you? "Make up your mind, or I’ll make it up for you... That is pretty much what the universal mother is saying to us all. Make up your mind, or I’ll make it up for you. So who is making up your mind? Are you living deliberately and making up your own mind?" Chinese, Dutch, English, Farsi, French, German, Hebrew, Hungarian, Icelandic, Italian, Japanese, Korean, Norwegian, Polish, Portuguese, Spanish and Swedish. For people who need to make decisions. For anyone wanting to understand how beliefs and experiences work.